Computer Bible Games for Microsoft Small Basic is designed to help beginner Christian middle-school students understand Small Basic programming concepts while developing “fun and simple” learning games and Computer Bible Games. Microsoft Small BASIC is a simple BASIC programming environment designed specifically for kids to help prepare them for more complex programming languages like Visual Basic, Visual C# and Java. Small Basic also includes a “graduate code” button which automatically converts the student’s source code into Microsoft Visual Basic . 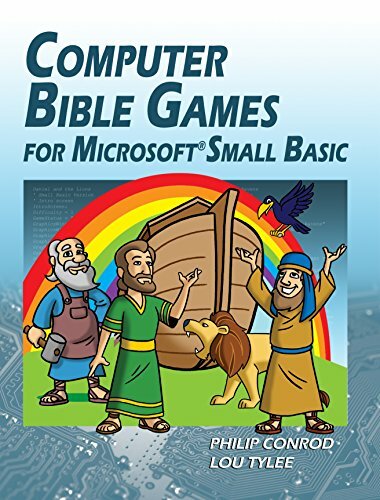 The Computer Bible Games for Small Basic tutorial consists of 13 chapters <Table of Contents> explaining (in simple, easy-to-follow terms) how to build Small Basic applications. You will learn about program design, text window applications, graphics window applications and many elements of the Small Basic language <Sample Chapter Preview>. Numerous examples are used to demonstrate every step in the building process. The tutorial also includes several detailed computer programs to illustrate the fun of Small Basic programming. The “learning programs” include a unit conversion program, savings calculator, a sub-sandwich builder, a card wars game, a number guessing game, a state capitals game, a times table program, a stop watch, a simple drawing program, fun logic games and a fun video game. Finished programs can even be published on-line to share programs with others. Click <here> to see screen shots of completed projects. The Minimum Software Requirement for this tutorial is the free Microsoft Small Basic v1.0 Development Environment and you will need Microsoft Windows XP (or higher). If you are using Microsoft Windows 7, 8, or 10, you will need to download and install the free version of Microsoft Small Basic 1.2. You have the option of ordering this tutorial in a paperback textbook format which includes a free E-Tutorial E-Book Internet download OR you can save printing costs and order just a E-Tutorial E-Book Internet Download Only Edition. This tutorial is delivered in the Acrobat PDF, EPUB, Mobi & Microsoft Word E-Book formats. The entire E-Book and/or selected chapters can be printed on your local printer and/or viewed on your computer screen. The E-Books can be downloaded from our website immediately after purchase. We compress all these files using a .zip format to help reduce the size of files for faster downloading. If you are a full time school teacher or a Homeschool CO-OP Instructor you may be interested in our Annual Unlimited User Site License Teacher Digital E-Book Edition. Our Teacher Edition allows you to distribute the tutorial and source code to any of the students who attend your computer science class.You can customize and personalize the tutorial and the associated source code to fit your unique teaching style whether the class is self study or instructor led. Since this Tutorial is distributed in an editable Microsoft Word format you can add your own teaching text and/or notes around our teaching text.You can add your own diagrams and/or personalize the E-Book tutorial to fit your specific teaching needs. Unlike other Tutorials that are Paper or PDF based, you can modify our teaching narrative and source code inside the tutorial and reprint as needed. This unique flexibility sets us apart from all other tutorials on the market. We also sell special large scale multi-teacher site license agreements for School Districts and Online Schools. Please contact us directly if you are interested in a large scale license agreement via the Contact Us tab above. “What I appreciated about this particular tutorial is that it is written in easy to understand language. I found the program to be very well organized. I loved the fact that we were taught in small steps. That was helpful for me as well as Josiah. We are going to use it again this summer. He is excited to be able to show his cousins and friends what he has created! I highly recommend this product. “We received a copy of Computer Bible Games for Microsoft Small Basic to review in our homeschool. When I heard about this opportunity, my husband and I were excited because our eldest son has an interest in computers and we thought this product might be a great fit for him. We were not disappointed. Computer Science for Kids takes Computer Bible Games for Microsoft Small Basic and makes the tedious process of learning a computer programming language user-friendly and fun. We thought this program was user-friendly and a great way for kids to learn more about how computer programming works. Our ten-year old was able to complete the tutorials with only a little assistance after the initial setup in the first couple of lessons. We were pleased with the tutorials and the results that were produced in such a short amount of time working with the curriculum. I would recommend this program for self-motivated students with a good eye for attention to detail. “I can really see Jonathan was enjoying himself as he learned more about computers and their programming. As a parent and teacher, I really like how this curriculum is put together. It covers every step, from installing the software to color selections for the program. They explain things in ways that are simple enough for middle school and high school students to grasp and be able to follow as they work through the lessons. It is very thorough and explanatory. We are about half-way through it right now and Jonathan is loving it. Each step closer to the finished project he gets more excited. Computers and more importantly computer technology is going to be a very important part of the future. By giving our children access to technology and training them how to understand and use it is an important skill to have today. It will be a valuable asset to them. Overall, I would definitely recommend this course to any homeschooling family. It is perfect for the child who wants to learn more about computer program writing. “We used this program exclusively with Benjamin, who is 11. He was very, very, excited to be able to take a programming class. I think he was most excited that he got to work exclusively with Dad for this program. So this review is my observations of watching my husband work with my son, using the Microsoft Small Basic program and the Computer Bible Games Tutorial. I, Mom, was impressed at how much Ben learned and used during this review. He must have been hungry for computer knowledge, because he talked about it during the week and even went back to the programs he wrote and used them again and again. I would recommend this program to anyone. I think it is a great program for both kids who know a little about computer programming and kids who do not even realize computers need a specific language to work (like my daughter). We will be continuing with this course until the end of the book as Ben was really enjoying himself and looking forward to learning more. “The tutorials are really well written and a good challenge to work through. We found the first few lessons extremely easy to whip through, as they were basics that we have already learned – how to open the program, open and save files, as well as how the program inherently works. But then things started to get more in-depth and the lessons took more time. I was actually quite amazed at how well my little man was able to grasp some seriously complex concepts that we haven’t covered in other ways yet: order of operations, exponentials, and square roots – for example. What we like: Big’s review of the program include the words “Awesome” and “Really Cool.” I think he likes it. (I’m actually not very surprised at that!). He loves the challenge of learning complex concepts and master them, and making things that are actually workable. For me, I found the lessons extremely detailed and well-written. Each new lesson made sure to review the one before, which meant that we could keep things fresh in our memory, especially when we ended up breaking lessons into a few days long instead of trying to finish them all at once. I liked having everything laid out simply so that I could follow along, reading aloud and then explaining it again to BigKid so I could make sure he understood. We were able to copy and follow-along with the actual code from the lesson to type into his window and immediately see results.